Free Estimate - Cruz Laminates, Inc. Please download our "countertop submission" template below and upload to the "free estimate" form before submitting, if possible. After downloading this form, please make sure to print it out and circle the "Edge Treatment" that you would like applied to your countertop. Also, if you can, please draw a sketch of what your current countertop looks like /or/ draw a sketch of what you would like your new, custom countertop to look. If you have any problems with this form, please contact us directly for further help needed. Please download this form from the top of this page if you haven't already. 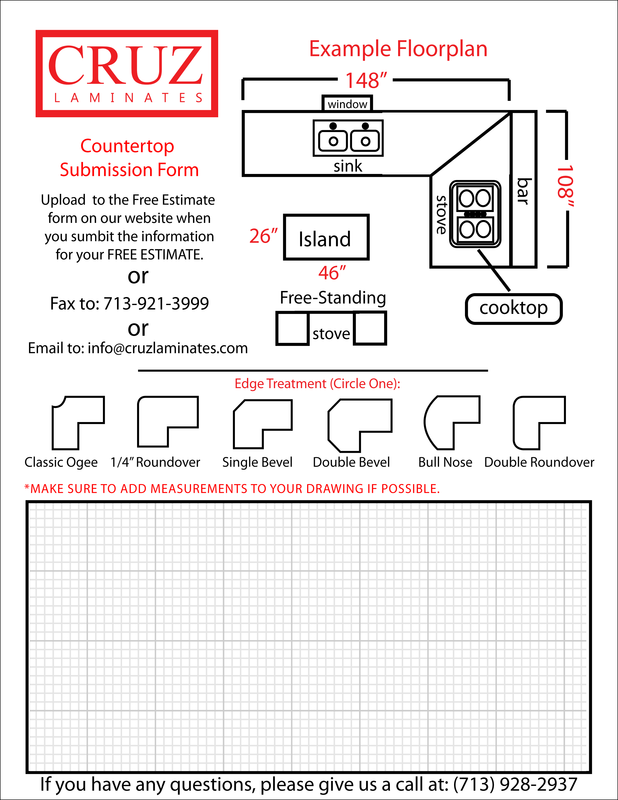 Print it out, circle the "Edge Treatment" desired, draw a sketch of your new or current countertop, scan the document and upload to this form. If you don't have a scanner, please email this document to info@cruzlaminates.com or fax to 713-921-3999. Thank you for choosing Cruz Laminates! Submit My Free Estimate Now!